This photo of Ira Yarmolenko is part of her own Photobucket collection which she posted prior to her death. The original pose included two friends and has been cropped for display here. Irina "Ira" Sergeevna Yarmolenko (Ирина Сергеевна Ярмоленко) was born May 2, 1988, in Ukraine. At the age of 8 in 1996, she moved with her parents and brother Pavel as refugees to North Carolina, USA, where she learned to speak English with a Southern accent within a few months, though she continued to speak Russian at home with her family. Pavel told WRAL that his family had immigrated because of religious persecution. Pavel's and Ira's parents took jobs as scientists in Greensboro, North Carolina, and later moved to Carrboro, North Carolina, with a Chapel Hill mailing address. Yarmolenko enjoyed acting, photography, hiking, tennis, basketball, playing the piano, listening to the Counting Crows music band, watching The Daily Show, knitting and writing and reciting poetry with her poetry group, the Chapel Hill Slam Team, which was renamed Sacrificial Poets in her memory. Yarmolenko graduated from Chapel Hill High School in 2006 and began studying at the University of North Carolina at Charlotte where she was gifted in science and math, worked in a campus computer center, was a photographer for the University Times and occasional writer for the online student newspaper Niner Online. She was also member of the UNCC Russian Club. Student records show Yarmolenko had an undeclared major at the time of her death, but a friend told News 14 Carolina that Yarmolenko was majoring in French. At the conclusion of her 2008 spring semester as a sophomore, Yarmolenko had planned to transfer to the University of North Carolina at Chapel Hill to major in public health. She died on May 5, 2008, 3 days after her 20th birthday. She is survived by her parents, Sergey and Yelena Vasina Yarmolenko, one brother older than she by five years, Pavel Sergeev Yarmolenko, and by a number of relatives from Ukraine including cousin Natalie Deyneka who, along with Pavel Yarmolenko, represented the family to media in the years following Yarmolenko's passing. A candlelight memorial was held for Yarmolenko at Belk Tower on the University of North Carolina Charlotte Campus at 7:00 p.m. on May 8, 2008. Visitation occurred on Friday and Saturday, May 9-10, 2008, at Walker's Funeral Home in Chapel Hill, North Carolina. The funeral was held Saturday, May 10, 2008, at 4:00 p.m. at Chapel Hill Memorial Cemetery. A memorial service for Yarmolenko was held Saturday, May 17, 2008, from 10:30 a.m. to noon in the Hanes Auditorium at Chapel Hill High School in North Carolina. The Yarmolenko family set up an Irina Yarmolenko Memorial Fund to be "used for programs that promote social cohesiveness and education," according to her brother Pavel Yarmolenko via Facebook. On August 2, 2008, The Realistic Female Self-Defense Company which provides safety programs for women organized a Ira Yarmolenko Memorial Violence Prevention Training Event at the Carrboro Century Center in Carrboro, North Carolina, partnering with the Yarmolenko family and Blauer Tactical Systems, Inc. The Realistic Female Self-Defense Company later held a Celebration of Life event in Yarmolenko's memory. It was held at the Chapel Hill-Carrboro Chamber of Commerce on Sunday afternoon, June 14, 2009, over a year after her death. 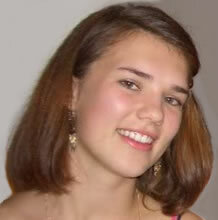 On January 10, 2014, the University of North Carolina Charlotte College of Arts and Architecture established the Irina (Ira) Yarmolenko Memorial Scholarship. See a copy of the event program here and the Yarmolenko family pictured with Theatre Chair James Vesce here (from left to right: father, brother, Vesce, cousin Natalie Deyneka and Yarmolenko's mother). Several weeks after Yarmolenko's death, an informal memorial event was held at Jackson's Java coffee shop in Charlotte, North Carolina, where Yarmolenko previously worked. During the memorial, media filmed interviews with Yarmolenko's brother and mother in the outdoor seating area in front of the shop. As late as October 2010, a regular customer reported that the shop kept a photo of Yarmolenko on the counter. The shop had gone out of business by 2016. 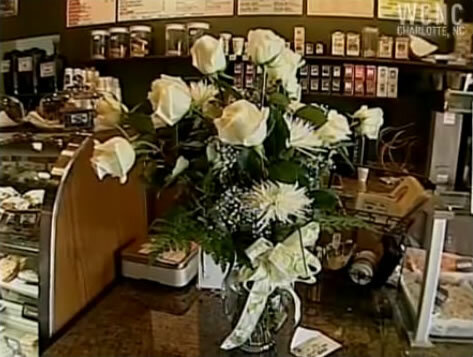 The flowers pictured below courtesy of WCNC were placed on the Jackson's Java counter within days of Yarmolenko's death. R.I.P. 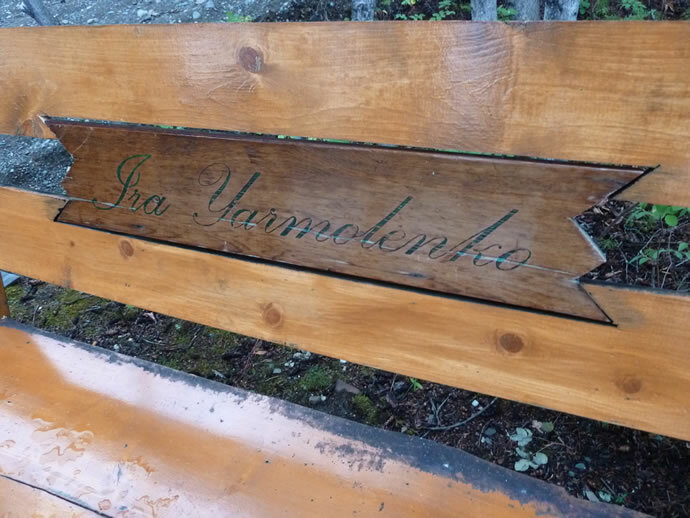 Ira Yarmolenko - This is a collection of photos and videos including from the summer of 2007 when Ira worked at McKinley Village Lodge in Alaska. Press play on the three videos in the top row to see Ira hiking and to hear her voice. Memories of Ira Yarmolenko by Eli Kaiser. Corrie Lyn Canche painted Yarmolenko's face posthumously. The painting was displayed at Chapel Hill High School before being given to Canche's sister who had known Yarmolenko. Ira Yarmolenko's gravesite at Chapel Hill Memorial Cemetery in Chapel Hill, North Carolina. 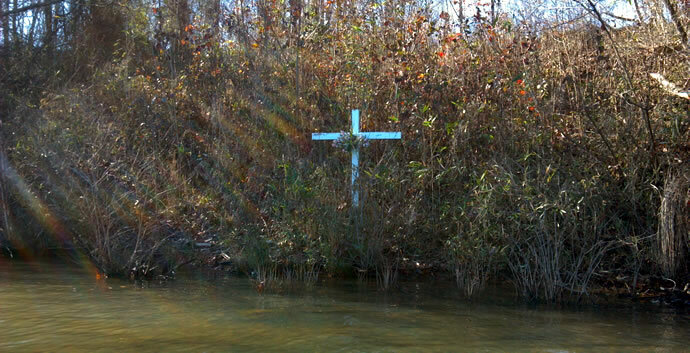 The site of Ira Yarmolenko's death is marked by a memorial cross which was placed by the jetskiers who discovered her body, Dennis Lovelace and Brenda Pierce. 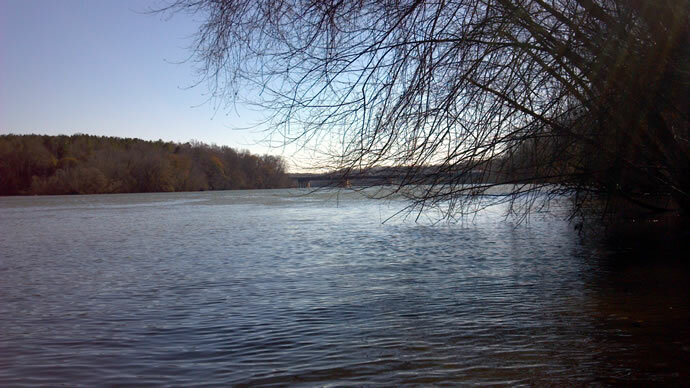 The level of the Catawba River varies, sometimes rising above the foot of the cross and sometimes dropping several feet below the water level shown here. The final photo is the view from the site of the memorial to the south, showing the Interstate 85 bridge. These photos were taken on December 16, 2013. Photos Copyright 2013 FreeMarkCarver.com on behalf of a North Carolina contributor. Please contact us for permission to reproduce. 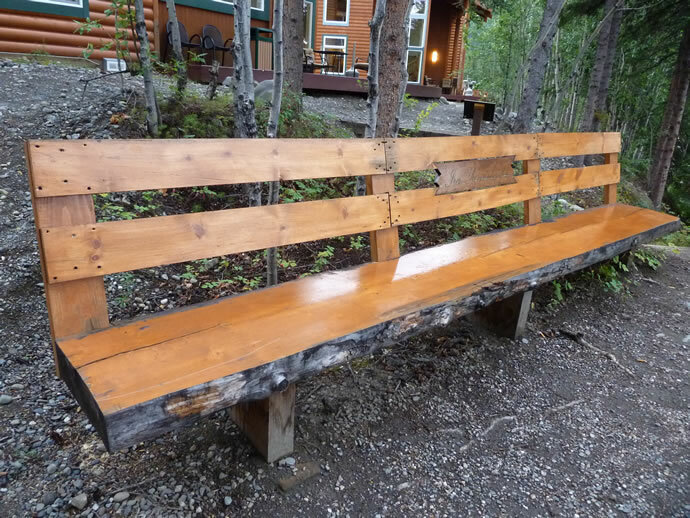 Kansas City based artist Shane Blindt designed and installed this bench at the request of many co-workers whose lives were touched with Ira's presence during the 2007 McKinley Village Lodge summer season. Lettering on memorial was hand drawn with pen showing the elegance and beauty of Ira's outward expressions contrasted with a raw an rugged placement into the world she left behind. On September 5, 2013, Dan Woolf of alaskanwoolfman.blogspot.com sent us the following messages and the photos shown above. Thanks so much to Dan Woolf for his story and permission to publish his photos here. I started working at the [McKinley Village] lodge mid summer this year in maintenance. 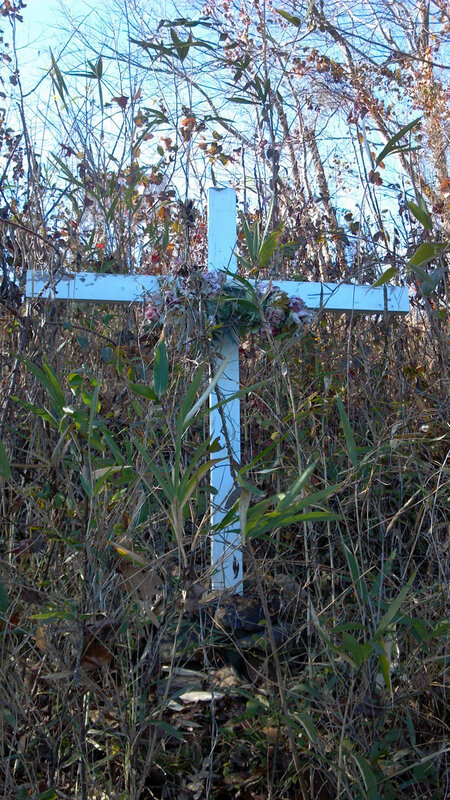 I saw a memorial bench down by the river with her name on it. The backrest was pretty wobbly so I took it on as a little project. I was very happy with the result reattaching very securely. I wondered just who Ira was and how the bench became to be there. No one around here knew. I found the information about her on the web. Very sad, I'm so sorry. I see from her Photobucket picture she was here. . . . 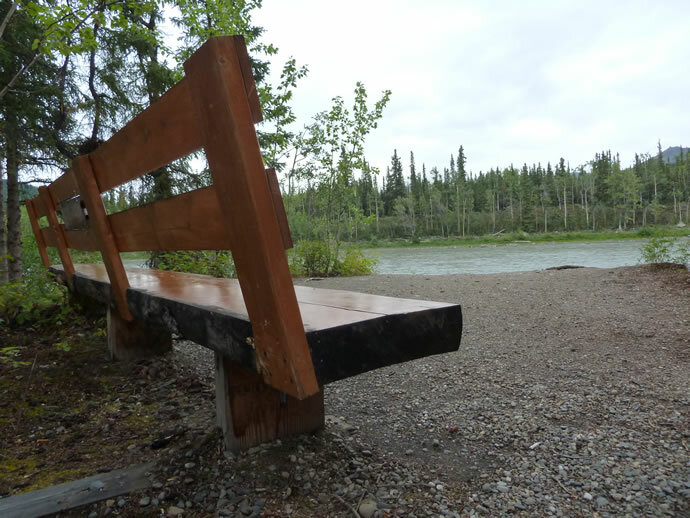 I am getting ready to post the next blog entry about hiking the Oxbow trail just across the river from the lodge and where the bench is facing. I recognize some of the places in her Alaska album on Photobucket. Her three friends walking across the bridge crosses over to where you go to the trail. 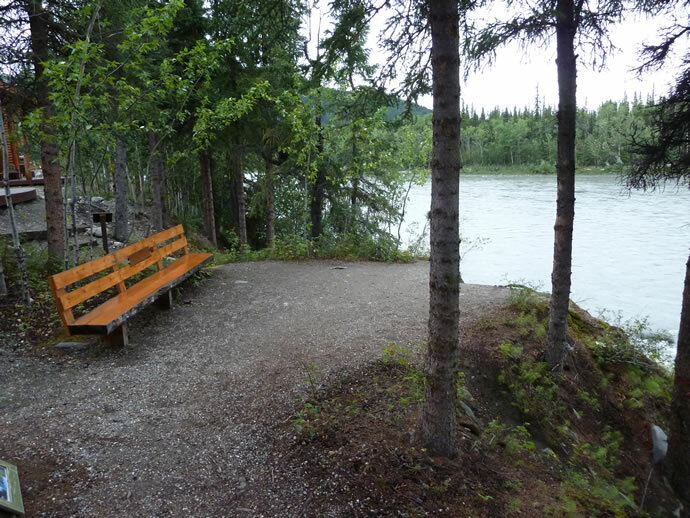 The river makes a 180 degree turn and the trail follows the inside loop. I will be happy to share the pictures . . . . [Later] I just published the post alaskanwoolfman.blogspot.com/2013/09/the-oxbow-trail. . . . I will a hike to Mt. Healy Overlook, one of the places Ira visited, soon. - Dan"